Mulberry Wing is our most seductive wetland skipper. Its rich blackish-red “mulberry” upperside and bright yellow cross pattern below regularly tempt observers to plunge into the marsh in search of it. Fortunately, it is still findable in Massachusetts in many conserved or managed sedge wetlands. Samuel Scudder was the first to describe and name this species, from a specimen from Carver, Massachusetts, which is still known as its “type locality” (Pelham 2008). Scudder's specimen (n.d.) is Type #15305 in the MCZ today. Scudder named it for Massasoit, the Wampanoag chief who was so helpful to the Pilgrims, signing a treaty of alliance with the King of England, and helping the new settlers celebrate their first Thanksgiving. Massasoit---like the skipper named after him---ultimately ceded much of his tribe’s land to the English. Scudder reported that “the eastern portion of Massachusetts has furnished more localities than any other” for this butterfly (1899: 1599). He knew of specimens from Belmont, Wollaston, Malden, Cambridge, Milton, Walpole, Wrentham, and Carver in eastern Massachusetts, as well as New Salem, Amherst and Belchertown mid-state -- quite a good list of towns, suggesting the species was not rare, but uncommon. Oddly, Scudder did not seem very familiar with the life history of Mulberry Wing. He called it double-brooded and appearing in the first half of June, when in fact it is single-brooded and does not appear until July. He lamented that the species had so rarely been observed. Thaddeus Harris' 1820-1850 Boston area collection did not have a specimen, and Harris does not discuss the species (Harris 1862; Index). Maynard (1886), an active naturalist around Boston in Scudder's day, described Mulberry Wing as “quite rare with us.” F. H. Sprague managed to collect fifteen specimens in Wollaston (Quincy) in July 1883, and three in Malden, and H. H. Newcomb found one in Milton in July 1900 (specimens in MCZ). But there are few other 19th century specimens. Perhaps many early naturalists spent more time in dry fields and climbing hills than wading through the wetlands. Conceivably the species was already declining in the Boston area around 1900; certainly in the first four towns Scudder lists Mulberry Wing could probably not be found today, because this part of its range is now one of the most heavily built-up regions of the state (Table 1). Fortunately, there are Mulberry Wings outside the Boston metropolitan area. In the west, F. H. Sprague found one specimen in Belchertown in 1883 (MCZ), and Scudder had seen specimens from Amherst and New Salem. In the east, Farquhar (1934) adds the towns of Middleton, Norwood, and Weston to Scudder’s list. Four Norwood specimens from 7/24/1925 are in the C. J. Paine Collection at the MCZ. In 1936 C. L. and P. S. Remington took twelve specimens of Mulberry Wing from the Blue Hills in Milton. In 1945 W. P. Rogers found Mulberry Wing in Fall River; and in 1962-65 C. G. Oliver took many specimens from Acton, west Acton and Boxborough. Specimens from these locations are in the Yale Peabody Museum. Unlike the Black Dash skipper, with which it is usually found, Mulberry Wing was apparently not present on Martha's Vineyard or Nantucket historically (Jones and Kimball 1943), and there are likewise no historical records for Cape Cod. Loss of wetlands due to urban and suburban development between 1900 and 2000 probably led to some decline in Mulberry Wing over this period (Table 2). Even so, collectors during the 1970’s reported it “common” in parts of eastern Massachusetts, for example Carlisle (E. M. Peters, 1971); Medway (W. D. Winter, 1973); and Holliston-Sherborn (D. Willis, 1973) (Lep. Soc. Seas. Sum. and Corresp. 1959-1981). William D. Winter found it in West Medway and Dover in the 1970's (Harvard MCZ). Mulberry Wing was finally documented for the Berkshires by O. R. Taylor in 1962 in Richmond, by D. S. Dodge in 1982 in Sheffield (Yale Peabody specimens), and by P. Z. Goldstein in 1990 at Sheffield Schenob Brook (MCZ). Occurring only in temperate eastern North America, the Mulberry Wing has a small and rather unusual range. It occurs in northeastern United States, from a few locations in southern New Hampshire, southwestern Vermont (VBS 2010) and southern Maine (MBS 2013), south only to Maryland. This southern New England/mid Atlantic population is disjunct from another identical population around the Great Lakes and upper midwest (Opler and Krizek, 1984). Lepidopterist Art Shapiro has argued that many butterflies, including the univoltine sedge-feeding skippers like Mulberry Wing, Black Dash, Two-spotted Skipper, Broad-winged Skipper and Dion Skipper, probably recolonized southern New England after the glaciers using the most obvious route: north along the Atlantic coastal plain. They then migrated across New York via postglacial wetlands to re-enter the Great Lakes area from the east. 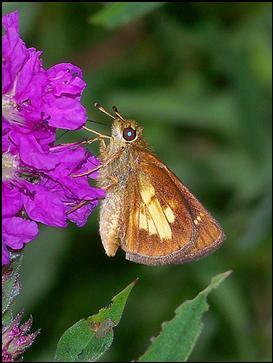 He argues that the present-day distribution of the Two-spotted Skipper illustrates this postglacial pathway, and that the disjunct distributions (gap between the Great Lakes and New England populations) of the Broad-Winged Skipper, the Black Dash, the Dion Skipper, and the Mulberry Wing are explained by the subsequent drying up of these marshes in central New York (Shapiro 1970b, incl. maps). The inclusion of Mulberry Wing in this interesting theory has been called into question by Shuey (1985), who showed that Mulberry Wing is not present in northeastern Ohio and could just as easily have entered Ohio from the west (Iftner et al. 1992: 18, 54). Mulberry Wing’s sole habitat is sedge wetlands; it seldom strays far from these special locations. The sedge habitats can be small, e.g. 50 meters wide (Layberry et al., 1998), or “a few hectares” (NatureServe 2014), so that Mulberry Wing can often be found in roadside, railroad bed, or power line sedge patches. It is relatively sedentary, but "will move a kilometer or more for nectar" (NatureServe 2014). As long as the host sedge is present, the type of wetland can vary from quite open to partially wooded. Mulberry Wing is not found in deep shade, but it is often under trees. Populations can appear quite small, for example 20 or less seen in a day (NatureServe 2010). The host plant is our native tussock sedge (Carex stricta), and possibly other narrow-leaved sedges. The flight is low and weak, often weaving in and out among the sedges, and resting on leaves. Mulberry Wing often occurs in association with Black Dash, a Euphyes species with similar host plants, habitat, and range. Both the 1986-90 Atlas and MBC records rank Mulberry Wing as “Uncommon.” In MBC 2000-2007 records, Mulberry Wing was found somewhat more often than Black Dash, but both fall into the Uncommon range (Table 5). The 1986-90 MAS Atlas found Mulberry Wing in 54 out of 723 blocks searched. Mulberry Wing shows a declining trend in sightings per total trips between 1992 and 2009 (Chart 100). Even if we take into account that 1992 and 1993 had rather smaller numbers of observers and trips, the greater effort (2-3 times the number of trips) put forth by butterfly enthusiasts since then did not produce commensurately greater numbers of Mulberry Wings. Still, there has been a slight upward trend from the low in 2000 to 2009. Separate analysis of 1992-2010 MBC data using list-length methodology showed a similar result: a statistically significant 30.9% decline in Mulberry Wing detections over this time period (Breed/Stichter/Crone 2012). The decline has no easy or obvious explanation. The unadjusted totals of Mulberry Wings reported per year in the state 1992-2013 are not very large; they vary from a high of 263 in 1999 to a low of 27 in 2000, averaging about 100-150 in 2011-2013. There is a great deal of yearly fluctuation in the adjusted and unadjusted numbers, a phenomenon also observed on some of the long-running NABA Counts with regular Mulberry Wing reports, such as Concord, Foxboro and Blackstone Corridor. On the Concord NABA Count, which has reported Mulberry Wing every year but one 1991-2013, the totals have varied from 60 in 1999 and 46 in 2006, to 0 in 2007, 1 in 1996 and 2009, and 2 in 2005 and 2010. There is no obvious correlation with the statewide annual fluctuations, nor with the patterns on the Foxboro or Blackstone Corridor counts. Mulberry Wings seem to be responding to particular local conditions in each area. Both Mulberry Wing and Black Dash are vulnerable to natural succession in wetlands. One colony of Mulberry Wings in a small wetland adjacent to a commuter rail line in Rockport was monitored every year 1993 through 2009 by D. Savich and C. Tibbits. Numbers at this location (the only known site for this species and Black Dash on Cape Ann) have varied greatly, but with an overall downward trend as the wetland succeeded to shrubs. Numbers counted were 9-20 in 1993-1996, 1-5 in 1997-2001, then 21-25 in 2002-2004. But from 2005 through 2009, only 1 or 2 Mulberry Wings were seen each year as the wetland became shrub-dominated. A similar pattern was seen for Black Dash at this site. The 1986-90 MAS Atlas had found Mulberry Wings mainly in a ring of blocs outside Rt. 128 around Boston, and in the Connecticut River valley. BOM-MBC reports (Map 100) confirm that part of the species' range but add many more reports across the central part of the state, the Quabbin Reservoir area, and the upper Connecticut River valley. There are still very few reports from the northern Berkshires and the foothills east of the Berkshires. Between 1992 and 2013, Mulberry Wing was reported from 77 out of 351 towns in the state (Map 100), and Black Dash was reported from 69. Southeastern Massachusetts: Mulberry Wing is hardly found in this region today, despite the fact that Carver was its historical "type locality." Mulberry Wing is well-reported from the cluster of towns around Foxborough in the north. But further south, Middleboro and Dartmouth are currently the only towns from which the species has been reported. There are only two reports from south Dartmouth; singles at MAS Allen's Pond in 2011 and on the Bristol NABA count in 2000. The Middleboro reports are few, in low numbers, and the latest date is 2003; these need to be re-checked. In 1986-90 the Atlas found Mulberry Wing "apparently absent from much of southeastern Massachusetts." BOM-MBC records confirm this assessment. Cape Cod, Martha’s Vineyard and Nantucket: Mulberry Wing still has not been found in these areas. Neither BOM-MBC nor the Atlas have any records. Mello and Hansen (2004) do not list it for Cape Cod, and Pelikan (2002) does not list it for the Vineyard. It is not reported on the NABA Counts for these areas. Central Massachusetts: There are now many Mulberry Wing records from this region. The species’ flight coincides with the NABA Counts, and it has been reported most consistently and in the largest numbers from the Blackstone Corridor, Concord, Foxboro, and Northampton NABA Counts. For example, the Blackstone Corridor count found Mulberry Wings every year 2001 through 2013, in double digits (15-39) most years. The long-running Concord count found Mulberry Wings every year but one (2007) 1991 through 2013; 17 were found in 2013, some of which were in neighboring towns such as Acton. Connecticut River valley: Mulberry Wing is found throughout the valley, from south to north, in suitable habitat. It is usually, but not every year, reported on the Central Franklin and Northampton NABA Counts. Central Berkshires: Mulberry Wing has been reported only infrequently, and in very low numbers (1-2), from the Central Berkshire NABA Count. The species was reported in only five of the last 20 years: 2013, 2011, 2008, 2005 and 2004. Mulberry Wing is listed as "Uncommon" in sanctuary records for MAS Canoe Meadows WS in Pittsfield, and MAS Pleasant Valley WS in Lenox (see accounts by R. Laubach in MBC Site Guide (Stichter 2005); however, there are no actual MBC or BOM recent reports from these sanctuaries, or from any other town or locations within the Central Berkshire NABA area. Nevertheless, Pittsfield and Lenox are shown on Map 100 on the basis of the older sanctuary records. Southern Berkshires: Mulberry Wing is reported with a bit more frequency from the Southern Berkshire NABA Count. For example, a recent report of 37 in Great Barrington on 7/12/2013 (B. Benner) suggests that Mulberry Wing may be more widespread and numerous in the southern Berkshires than is apparent from the data. Northern Berkshires: Mulberry Wing has not been reported on the Northern Berkshire NABA Count, however F. Model and E. Nielsen found 6 in the town of North Adams on 7/14/2007. Athol Branch Bridge Rd., 20 on 7/11/2011, F. Model; Easton, 32 on 8/6/1992 B. Cassie; Grafton Hennessey property, 16 on 7/10/2011, E. Barry et al. ; Harvard Oxbow NWR, 4 on 7/18/2004 T. Murray; Ipswich Appleton Farms, 25 on 7/7/2012, S. Stichter, R. Hopping, H. Hoople; Leverett Leverett Pond, 9 on 7/21/2013, E. Barry and W. Howes; Longmeadow Turner Park, 4 on 7/10/2004, R. Pease; Marlborough/Northborough Crane Swamp Trail, 42 on 7/17/2011, S. Moore and B. Volkle; Milford power line, 15 on 7/25/2009 E. Nielsen; Milton Fowl Meadows, 6 on 7/17/2009 S. Jaffe; Rockport rail line behind Babson Museum, 25 on 7/25/2004 D. Savich and C. Tibbits; Sharon Moose Hill Farm, 9 on 7/5/2010, E. Nielsen; Sherborn gas line, 50, and power line, 15 on 7/12/2009 B. Bowker; Upton, 9 on 7/14/2012, T. Dodd; Ware Klassanos property, 8 on 7/11/2010, B. Klassanos; Westborough WMA, 7 on 7/9/2008 W. Miller et al. NOTE TO COLLECTORS: MULBERRY WING IS A REGIONALLY UNCOMMON, SPECIALIZED, AND POSSIBLY DECLINING SPECIES IN MASSACHUSETTS. IT SHOULD NOT BE COLLECTED EXCEPT FOR SCIENTIFIC RESEARCH UNDER THE AUSPICES OF AN EDUCATIONAL OR SCIENTIFIC INSTITUTION. Mulberry Wing is an obligate univoltine; it needs the cold winter to complete its life cycle. It has a relatively concentrated flight time in Massachusetts, from the last week in June through the end of August, with peak time during the last three weeks of July (http://www.naba.org/chapters/nabambc/flight-dates-chart.asp). Earliest sightings: In the 23 years of BOM-MBC records 1991-2013, the five earliest "first sightings" are 6/28/2012 Athol, F. Model; 6/29/2006 East Longmeadow, K. Parker; 6/30/2010 Crane Swamp Trail, S. Moore and B. Volkle; 7/1/2000 Foxboro NABA Count; and 7/2/2002, Middleboro, K. Holmes. The particularly warm springs of 2012 and 2010 seem to have affected emergence time in this species. In the first three years listed, the "first sighting" occurred in June. In the next 13 of the 23 years, the first sighting occurred in the first week of July (7/1 - 7/7). This was the most frequent "first sighting" week. In the remaining years, the first sighting came later than 7/7, but observers were probably missing the onset of the flight, not getting into the field until the mid-July NABA Counts. There is some change in timing of first sightings over the 23-year period: the three June reports are all in recent years, while nearly all first reports prior to 2005 were in early to mid-July. Latest sightings: In the same 23 years of records, the five latest "last sightings" are 8/25/2002 Milford power line, B. Cassie; 8/22/2003, Worcester Broad Meadow Brook, D. Price and B. Walker; 8/20/1992 Easton, D. Lang et al. ; 8/16/2009 Ware, B. Klassanos; and 8/15/1995 Rockport, D. Savich. Scudder does not provide enough nineteenth-century data to make comparisons possible. Mulberry Wing is a special butterfly, endemic to temperate eastern North America. Its fortunes rise or fall with the increase or decrease of sedge wetlands. The spread of the invasive reed Phragmites in our wetlands is a serious threat to Mulberry Wing habitat. Natural succession into shrub/treed wetlands is also a major threat. Management efforts to counteract both these processes could positively benefit this species. The preservation of a network of healthy sedge meadows in Massachusetts is critical to the survival of this specialized species. Much wetland and sedge meadow habitat has already been lost in this state as a result of urban and suburban development. Current wetland protection laws may protect remaining populations of this species, but documentation is lacking from many likely wetland areas. Despite Mulberry Wing’s somewhat sedentary nature, small habitats not too far apart probably will eventually be colonized (NatureServe 2014). Given its small and northerly range, Mulberry Wing may be vulnerable to range contraction at the southern limit of its range due to climate warming, but how this might affect Massachusetts populations is unclear. More research is needed. (For species affected by climate warming, see Table 6). Along the eastern Atlantic coast, Mulberry Wing’s current range extends south only to Maryland and central New Jersey, and north only to the southern tip of Maine. It is ranked S2 or "imperiled" in Pennsylvania (NatureServe 2014). Mulberry Wing should be considered a Species of Conservation Concern in Massachusetts. Its strong fluctuations, downward trend, and climate change vulnerability are worrisome. Habitat loss is probably the chief threat. Greater effort to find and monitor Mulberry Wing colonies is needed. In neighboring states to the north, Mulberry Wing’s status is even more fragile. In Maine, it was not known prior to 2005 (Webster and deMaynadier 2005), but was found in three townships in southern Maine during the 2006-2009 Butterfly Survey (MBS 2010). Could the species be extending its range northward? In New Hampshire the species is ranked S2 or imperiled (NatureServe 2014), and is found in only a few southern counties (BAMONA 2010). In Vermont, its state-ranked status is S2 or imperiled, it is of conservation concern, and is found in only a few Atlas blocs in the southwest of the state (VBS 2010; NatureServe 2014 ranks it S1 or imperiled). These regional considerations strengthen the case for conservation in Massachusetts.